Online Slots Tournament – Worth Trying? 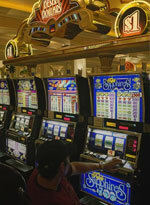 In online slot tournaments, the players involved pay an entry fee. All the money collected as entry fees goes into a pool. The money is then divided among winning players while the Casino gets a cut for hosting the tournament. These tournaments are found in two categories. Here, any player interested in being part of the tournament has to register and play within a set time. Once the time allocated elapses the credits are recorded. This game is schedules for a particular period during which the competition is open for players to participate in. Once the time set for the tournament comes to an end, all the player’s credits are considered, and the one with the highest number of credits wins the tournament. They get the prize money set aside for the winner, and runner ups also get some prize money, although not equal to the money given to the overall winner. These require that a particular number of players register for the tournament before it can be played. Once the set amount is reached, the players begin playing, and at the end of a set time, the credits attained by all the players are compared. The person with the highest score in terms of credits wins the main prize and others get the runner up prizes, if any. The beauty of online gaming is that you don’t have to leave the comfort of your home to enjoy a game. So many people are turning to online tournaments because they are convenient. It is also a good thing that you can play a tournament without having to pay any entrance charge as some are entrance-free online events. Slot tournaments have a large pool of players, as long as you meet the criteria for playing - you are in. The players get the same budget and play by the same rules- start at the same time and finish at the same time. The winner or group of winners divides the spoils. The fact that you can get into an online slot tournament for free is another advantage even though it offers fewer returns since there are many competitors as people love free things. Playing online slot tournaments is worth it if not to build your skill, at least because you don’t have to do much but play. This is especially so with free roll tournaments. With time, you can build up to bigger tournaments that you have to pay an entry fee to participate in. If you are looking to gain experience, this is a good thing to do. However, it is only fun if you are a slot machine enthusiast so that you can enjoy the experience as you look to win and aim for better tournaments with bigger jackpots. Online slot tournaments are better than online slot games because they limit your financial losses. Once you enter a tournament, you get a predetermined amount of coins that can only hold you for a set period of time, and then it’s over. This is in stark contrast to the online slot games where you can continue playing for hours on end as long as you have money to do so.